Look upon it, in all of its majesty! It’s hard to believe, but it’s been 15 years since a major event happened for US gamers: On September 29th, 1996, the third major home console from Nintendo released, the Nintendo 64. 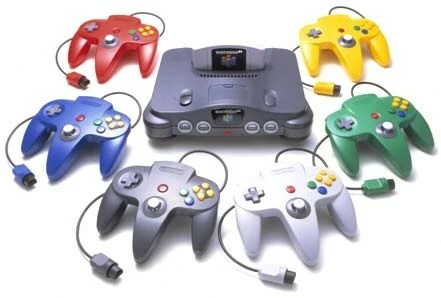 While some point to the N64 as the system that led to Nintendo’s disadvantage in the console war, it’s also worth pointing out that the N64 generation of games presented a number of timeless classics, and important advancements in gaming technology that shaped everything to come. Over the console’s lifetime, it sold over 32 million copies, featuring 64-bit graphics, four-player inputs out of the box, and a new control scheme unlike anything used commonly at the time. The controller, while outdated by modern-day standards, caused a revolution: for the first time, the analog joystick became a staple of game design. The single joystick design gave players what was, at the time, the most accurate version of fine control that had been seen to date. Using the design of the controller itself, designers were able to construct a series of games that blew away the competition. The system started strong, with Super Mario 64 bundled with most of the consoles sold, and what better way to show off the capability of the console than pairing it with a finely crafted adventure featuring their mascot? Even today, Super Mario 64 remains one of the most enjoyable games in the franchise, moving the game world into the third dimension, introducing a load of new content ideas, and opening up the world for each player to explore more and more. It became an instant classic, and an ultimate selling point for every gamer to prove why the system would be a success. Other games would follow: anyone who was anyone knew they needed a copy of Goldeneye, Legend of Zelda: Ocarina of Time, Super Smash Bros., Star Fox 64, and Mario Kart 64. Other games such as Perfect Dark, Diddy Kong Racing, and the legendary (or perhaps infamous) Conkers Bad Fur Day just added to the library of titles that people lined up to buy every release date. However, the system itself featured a large list of titles after a slow start. The list of titles started slow for Nintendo: in 1996, the system ended the year with a list of only 8 games, including one best seller (Super Mario 64). However, 1997 changed everything; when Mario Kart, Goldeneye, Star Fox, and the first Turok title hit the console, people really started paying attention. Even today, mentioning some of those titles to those of us who played them will make our eyes involuntarily glaze over as we remember the continuous hours spent glued to our TVs. By the end of 1999, the N64 list of games had expanded to 214 titles released in North America (161 in Japan and 175 in Europe). While some titles were flops (I’m looking at you, Duke Nukem 64), a number of games would go on to inspire some of the greatest games to come. Think 1080 Snowboarding to the SSX series, big change! Things couldn’t be all rosy for Nintendo, however. The advent of the Sony Playstation marked a major shift in the “system wars”: while Nintendo stuck with the tried and true cartridge format for their games, Sony decided to move in the direction of CDs. The difference in formats would lead to a lot of game designers turning away, however, despite assurances that cartridges would feature faster load times and greater practicality. While the 32 million system sales of the N64 were impressive, they would be dominated by Sony’s inaugural console selling over 100 million consoles by 2005, leading to Sony becoming a dominant force in the game market. Even today, many remember this as the best game of its time. All things taken into account, the era of the Nintendo 64 marked a time of big changes in the game industry; despite strong titles and a proven game format, Nintendo was finally toppled as the dominant force in the game world. The list of over 2400 Playstation One titles would help lead them to the top, yet the N64’s list of impressive titles still help shape games today, and their innovations of the time have been advanced to the standards of today. At the same time, 15 years ago, who could’ve imagined the level of technology that games would advance to, when Mario 64 was the best looking game we had ever seen at one point. Durandal does indeed still own an N64, and yes, it’s hooked up to a high definition, flatscreen TV. ← Battlefield 3 Beta and Minecraft – Pocket Edition! These are the elastic or neoprene sleeves that are often found in grocery stores. Also known as clear braces, these braces are less noticeable than their metal counterparts. Recovery time for a dislocated knee is usually between one to three months. West Virginia Code Annotated; Rule 8,West Virginia Trial Court Rules (2007); Media Coverage of Courtroom Proceedings in the Supreme Court of Appeals, Rule 42( (2010). the very fact that it really is a small sized camera. To ensure that you are able to view the wireless recordings of your new system, you will need a dedicated internet connection over which the cameras can run.